It has been a few months now since the development of the game has been halted and I was surprised on how kind some of you reacted to that. As I went back to the Steam page a while ago I expected some bad readings but this was not the case. The community is still small and this can be an advantage as I believe that the damage can be smoothed out. Info: The game will remain on Steam and will be updated. 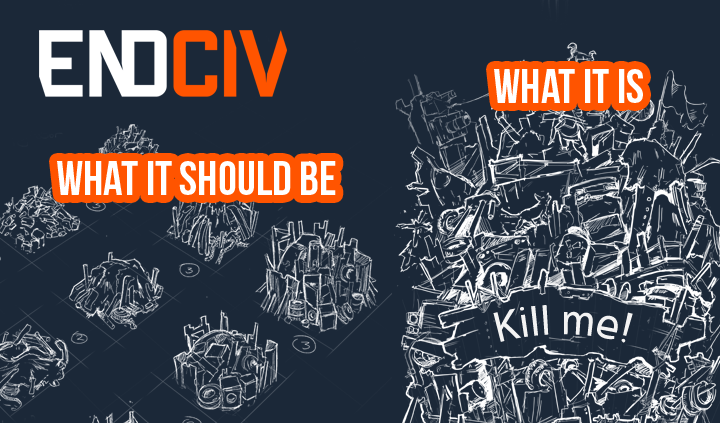 What I want to tell you today is that Endciv will receive a reboot. Endciv is at it's current state and vision like a misconfigured and misassembled machine. It started like it should have but during those numerous changes in my and my team's situation it morphed into something else and I was blindfolded from time to time. This is how I saw the game for the past year or so. I knew it was wrong and I wanted to fix it. I haven’t realized that I was on the wrong track. Endciv like what it is today is not what it should be and not what it ever can be. Don’t get me wrong. the major vision still remains but I have to cut all those features which do not provide a favour to either the gameplay and the development process. Pooping dogs that leave their stuff as a physical material on the ground? I don't think that we need that. Weather, Combat and Trade is all still very well for that game. The issues are not in the bigger picture, but in the details. Having an AI that works more like the Sims or RPG Characters combined with a city builder may works, but not for me. You can’t imagine what kind of stuff I drafted and how complex the AI is. But this is not good for scaling. You can’t manage a big city with all that micromanagement and that complex mechanics running on the CPU. Therefore all the micromanagement content must be erased. No more experiments, no fiddled in features. This also means that the interiors of buildings will be sacrificed. It is much more complex to handle. I will make a solid foundation with simplified gameplay and a regular city builder as we know it. Once this is running well, we can together see where it shall go. I will take some time to rethink this concept and how it can be organised on the development side. The Project will start totally from scratch. Of course I can make use of all what has been made so far but a total restart is the only way that will work out. Also I learned so much in that time that a new code base will enhance the game in many ways. Another reason is that I will consider the topic Open Source. I am not sure about that and one reason simply is third party content in the game. The current version is impossible to publish without a major review even though most of it was made from scratch. But one thing is for sure if I will find myself again in the situation that I can no longer support the development then I will publish the new source of Endciv. I will be back in some time, don’t expect me to have news within a few weeks. But I am already on it. Thanks for standing by. The very least you can do is give the community regular information as to where you are on the project. We WANT this game. There is none like it as far as I know of this calibre. We WANT this Tropico+Fallout blend. "It has been a few months now since the development of the game has been halted and I was surprised on how kind some of you reacted to that." I have been following this game fro a while as it seemed to have great potential. It sounds as if there is no real plan for what this game will eventually be. Could we have a description of what you actually intend to release, with maybe an updated trailer that reflects your changes? Dev is there any update? Please i rally need to know.. I have a BIG faith on this masterpiece! Glad I didnt buy this. I put it on my wishlist after it was put up for sale, but I didn't bite because we all know how often people are burned by early access. I come in to check how it's going, and the last "update" is a 2.5 month old message saying "sorry for not updating". @CLAS The latter one, the game on steam will remain and be updated. @ Bundeswehr206 That is unlikely sorry. I have also yet not decided at which state I should make a public update. I will leave that open for discussion once I can show the new state. So for clarification, does this mean you will be using the concept of endciv to make a new game or re-making the game from what it is to somthing more in line with a simplified or possibly streamlined concept?